I took the Dead Sea Mud Facial Mask on vacation with me when I went to the North Georgia mountains earlier this month. My mom tested it out with me. :) We had a little bit of a spa night. (I won't embarrass her and post pictures of her with it on her face though hehe). It is very easy to apply. Just scoop a little bit out and smooth onto your face. Avoid your eye area. Leave it on for 5-10 minutes and then rinse off! (I had to hop in the shower to rinse off because I was making a mess of the rental cabin's bathroom). 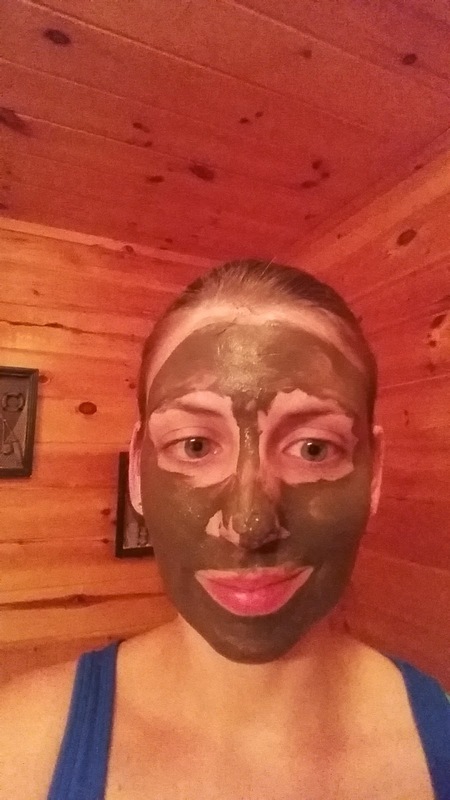 The mask is made from 100 % natural and organic ingredients. It is also cruelty free and vegan certified. This mask is available for purchase on amazon for a discounted price of $29.44 (originally $59.99). It comes in a 6 oz container and since a little goes a LONG way. . . you are bound to get facial after facial out of it. Definitely worth your money! Oh man! Am I the only one that is SO glad it is finally Friday? Stupid Question LOL! I have had a pretty roller coaster week so I am definitely ready for the weekend and a fresh start next week! Today for "ORANGE You Glad It's Friday?" I have Julep - Princess Grace! Please ignore my awful cuticles (I've had a rough week and apparently took it out on them!) Also, as you can see my nails are growing . . . unevenly but growing! 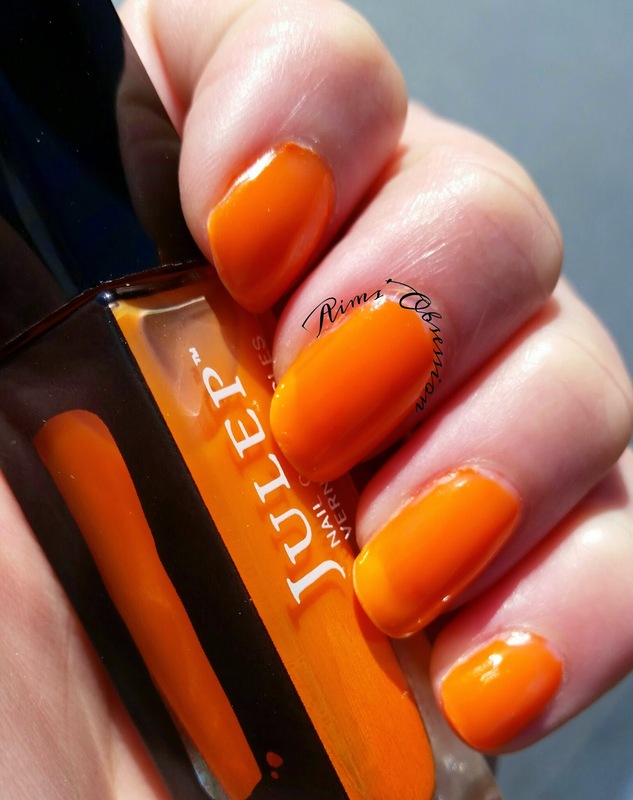 Princess Grace is a lovely orange creme which only took 1 coat of polish! I love one-coaters! It is also a 5-free formula. Princess Grace is from the It Girl box and is available for purchase on the Julep website for $14 if you aren't a maven and $11.20 if you are a maven. I do have some issues with it though. . . SO much polish came up with each dip. . . no matter how much I wiped on the inside of the bottle top. . . I felt like there was still a huge amount clinging to the brush. All in all, I love the color. It is perfect for summer. Don't you think? I'm not so sure I'll be using it again anytime soon though. (Still frustrated from the massive amounts of polish that clung to the brush). What do you think of the color? Anybody have it? I'd love to see your manis! Post them to my Facebook wall! 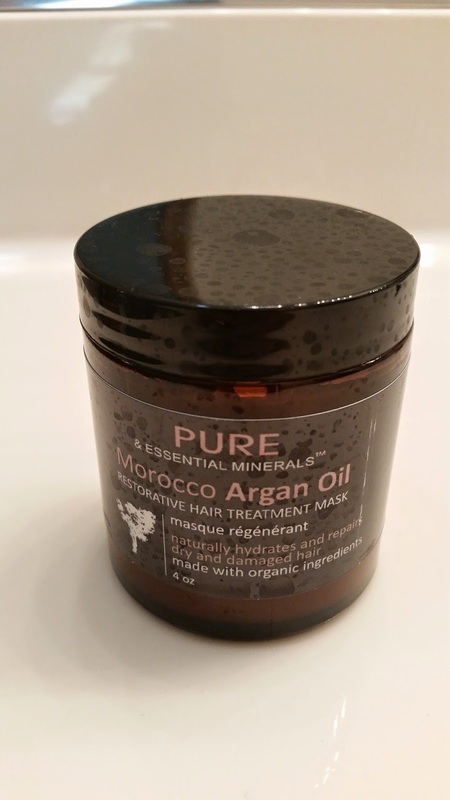 I received the Oraganic Morocco Argain Oil Hair Treatment Mask to review and have used it a few times since. As you can see from the water spots. . . it's been sitting in my shower. I'd say I have used about 1/3 of this container (4 oz container). This is supposed to be great for helping revitalize dry and damaged hair from hot styling tools. It is great for all hair types including color treated hair. Also, it does not require heat to activate like many other products. - Cruelty free and vegan certified! - The container doesn't seem like it will last very long, unless I'm just being too generous. - Not as thick as I thought it would be. Somewhat runny. I won't tell you what it reminds me of. Overall, I enjoyed the results from this product. You can purchase this product on Amazon for $15.99 (currently) on sale from $29.99. 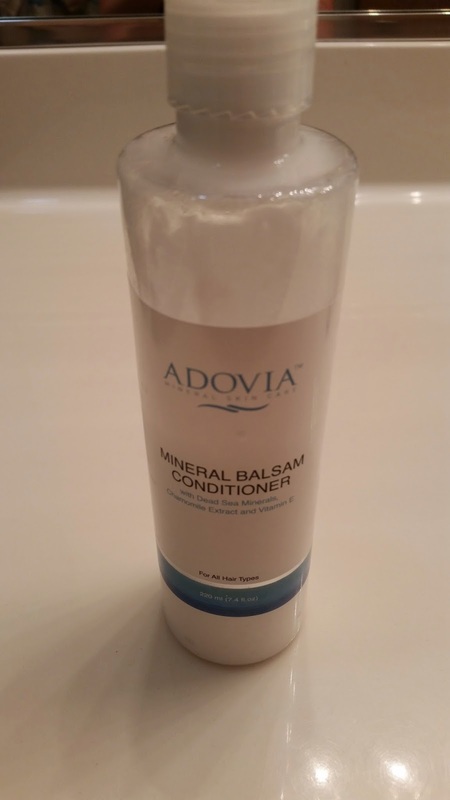 My husband and I have been using the Adovia Dead Sea Salt Conditioner for a couple of weeks now. It definitely gets the job done and leaves your hair feeling soft, shiny and hydrated. The smell is very light and pleasant. Nothing too over-powering. I am impressed! As you can see it's been well used! (Mostly because we took multiple showers on vacation due to getting dirty mountain biking etc). Adovia Dead Sea mineral hair conditioner is a hair balm which protects your hair from damaging influences while making it much easier to manage. 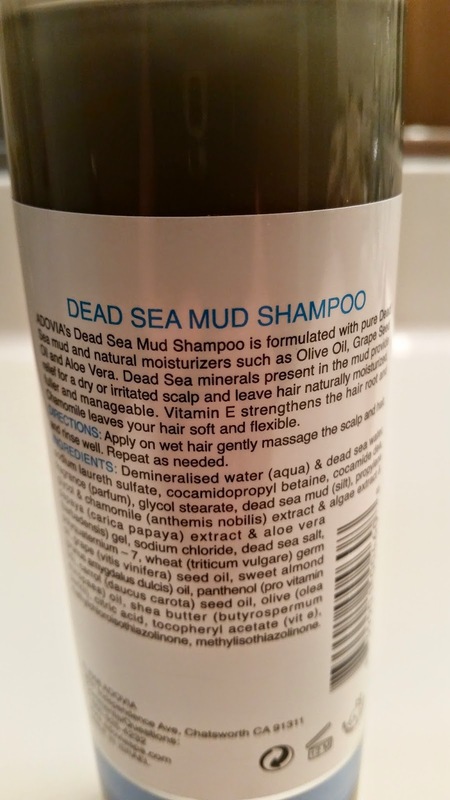 It's made with a specially formulated blend of Dead Sea minerals and natural wild flowers as well as essential oils to protect your hair and add a healthy natural look. Makes your hair look healthy, shiny and keeps it easy to manage much more than the traditional market conditioners. This conditioner is available for purchase through CleopatrasChoice.com for only $19. 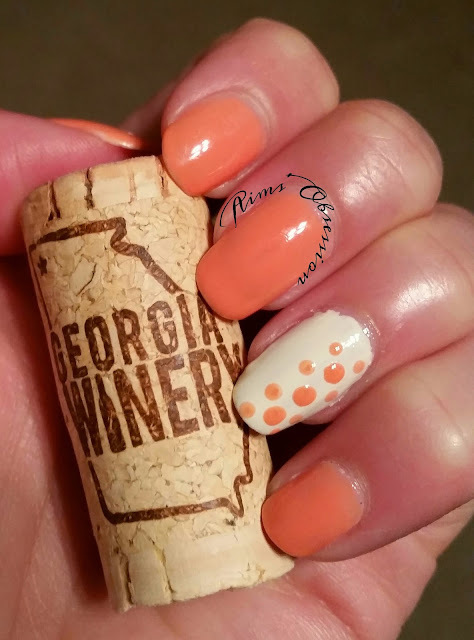 For this week's ORANGE you glad it's the weekend post I have a polish from Essie's 2014 Resort collection. 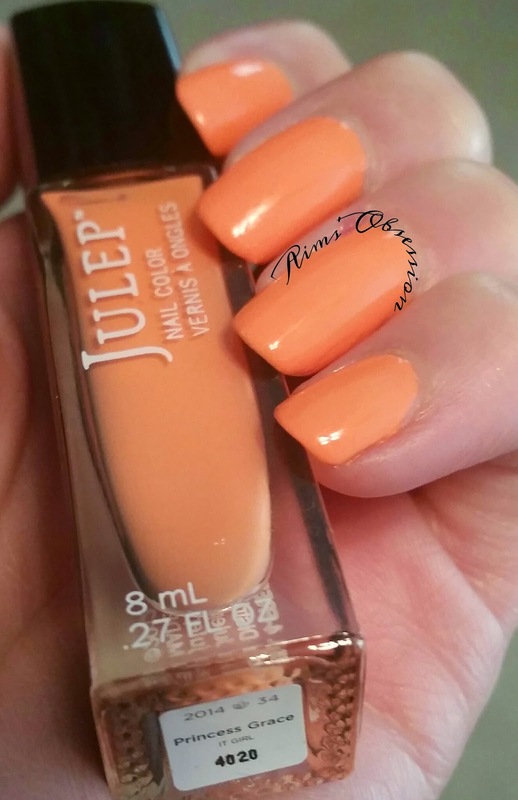 Resort Fling is a peachy coral color. It is a jelly/creme. I really like how this one looks! Great color for spring/summer. Resort Fling is a pretty nice formula. It only took two coats to achieve this look. Dry time was slightly longer than I'd hoped. Although maybe it was just me being impatient on vacation (and my nephew wanting to play Uno right away hehehe). I did a little bit of nail art using my dotting tools on an accent nail. The white is a creme from Color Club. 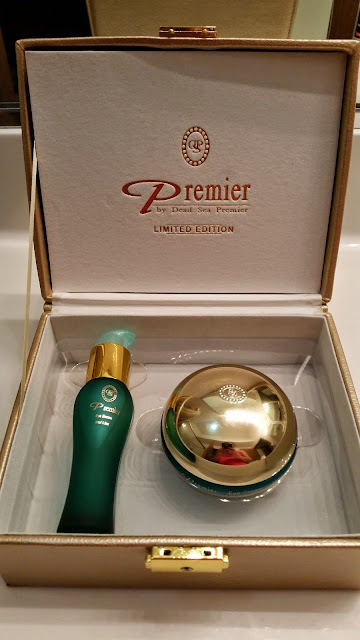 I really enjoyed the Premier Dead Sea Eye Duet Kit (limited edition box). Just like the last product I reviewed. . . it was very luxurious! Packaging was very nice. The eye serum and eye cream both came in a gold box with a latch on the front. Both products were in glass containers. Very nice! So far I haven't dropped them (let's hope I don't)! See what I mean? Great product representation! Both containers hold 1.2 oz of product. As before. . . a little goes a long way! A secret composition of soothing active ingredients specially adapted to nourish the sensitive skin around the eye area. It preforms triple firming actions for rejuvenation, moisturization, and anti-aging. 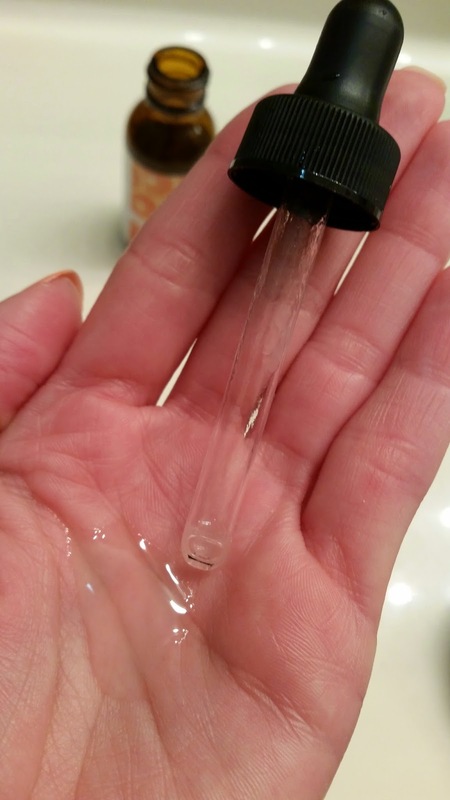 This unique Liposome Complex and oil-free serum moisturizes the skin causing a lifting effect. Thus, wrinkles are reduced, skin is moisturized and rejuvenated, skin tone is restored and it's structure reinforced. This ultra-modern formula is suitable for all skin types. It consists of the best anti-aging ingredients: Dead Sea minerals, Liposome Complex, Dunaliella Seaweed, Natural Aloe Vera, Oxygen, Vitamins E and A. It moisturizes and hydrates the very delicate skin around the eyes. It helps diminish dryness and fine lines and reduces puffiness. First you need to apply the Eye Serum. Only a little bit is needed. (In my picture I have an exaggerated amount to show consistency. In reality you only need a drop or two, so don't push too much on the pump. Apply to the delicate tissues around your eyes gently twice daily for best results. After eye serum has absorbed apply the eye cream gently in circular motions around he delicate tissue around your eyes. Then you can apply makeup as wanted. Now I can't tell you about how well it reduced wrinkles, as I don't have any yet. However, I can account for the skin around my eyes feeling super moisturized and luxurious. Here is the downfall for the Premier Dead Sea Eye Duet Kit: the cost on the premierdeadsea-usa.com website is $599.99. If you have the money for this product. . . I say definitely buy it! However, if you are like me and can't really afford $599.99 worth of product then I'd say try to find something else that works for you. I received another Vitamin C serum product recently! I am loving this serum! I haven't been using this specific one for very long (only about a week) but it works just the same as the last one I reviewed AND it's on sale for less. 1. 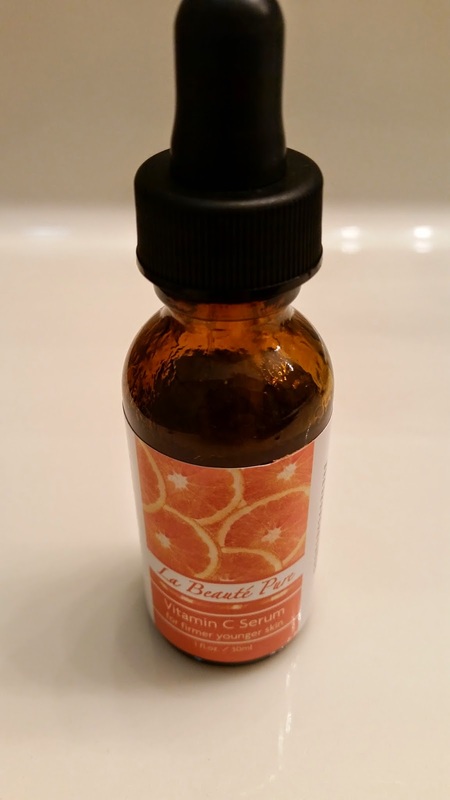 VITAMIN C SERUM: Order it Now! Our premium Vitamin C, Hyaluronic Acid, & Vitamin E Trio penetrate to beautify your skin fast. The sooner you try it, the sooner you'll see... It's safe & effective for all skin types, including sensitive skin. Our premium formula is plant-based, without parabens, alcohol, or fillers. Of course we make everything Cruelty-Free in the USA. 3. ANTI AGING SERUM: Want to see how it WORKS? But of course. One of the things you'll love is that as a powerful antioxidant, Vitamin C protects against environmental aggressors and neutralizes free radicals. This helps to reverse sun damage, sunspots and skin discoloration. Then consider the benefits of the Aloe, Vitamin E, Vegan Hyaluronic Acid, and Jojoba Oil, which heal & deeply hydrate skin cells, leaving skin visibly healthier, more beautiful, & softer. 2. BEST VITAMIN C SERUM FOR YOUR FACE: Buy 2 or More. Science & experience prove it works...Dermatologists, Aestheticians, & Celebrity Doctors agree - how about you? Topical Vitamin C in this formulation is THE Anti-Aging Secret. It beautifies your lovely face by reducing any fine lines, wrinkles & age spots, naturally brightening & tightening your skin. Reveal YOUR radiant skin with Day by Day Beauty's Vitamin C Serum Today: the #1 anti-aging, HIGH-DEMAND product available today. Buy Now while In Stock! 4. ANTI WRINKLE SERUM? 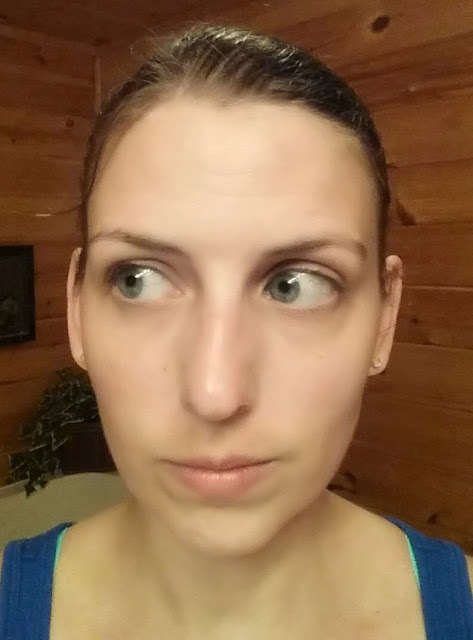 Goodbye, Wrinkles! What Customers Say: Many rave about additional benefits from using Day by Day Beauty's Vitamin C Serum including: reduced pore size, less breakouts, improvement of minor facial/acne scarring, and hyper-pigmentation correction. Imagine what Day by Day Beauty's Vitamin C Serum will do for your skin! Vitamin C Day by Day Serum has become a part of my daily skin care routine. I use it everyday before I put on makeup and mostly every night after I wash my makeup off before going to bed. 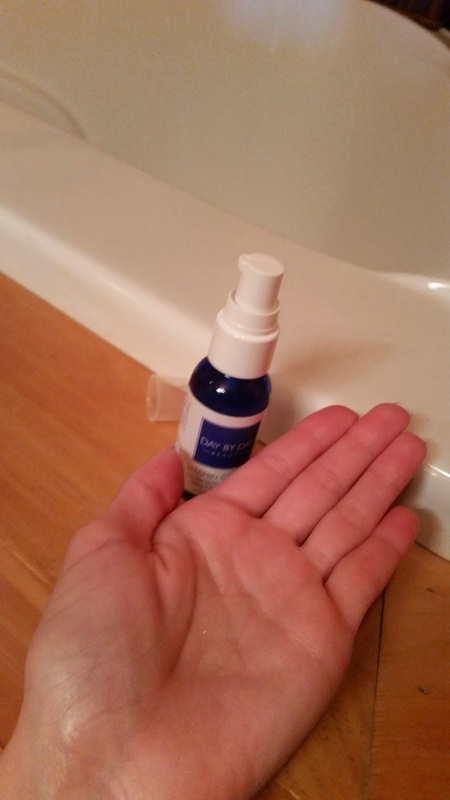 As you can see in the pictures this vitamin C serum comes with a pump instead of a dropper like the last one I reviewed. The pump allows you to measure your serum a little more conservatively and hopefully will make your product last longer in the scheme of things. As I said with the last product, a little goes a long way! You only need about 2 pumps (maybe 3 if you prefer). 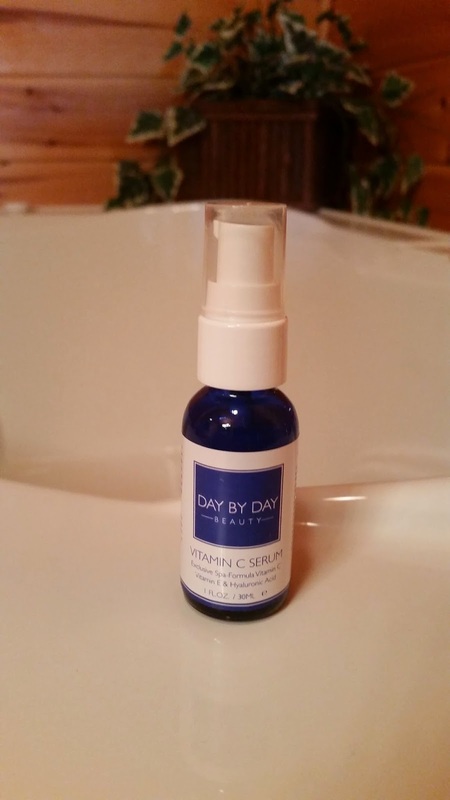 Again, you can find this product here: Vitamin C Day by Day Serum. P.S. It's on sale for $18.50 and in stock right now! Find out more about these products on the Day by Day Beauty website. ANTI-AGING SERUM: The best anti-aging skin care serum reduces skin discoloration and scars w/ powerful antioxidants, neutralizing free radicals, resulting in skin that is youthful and radiant. BEST FACE SERUM C: This absorbic acid serum (Vit C Serum) stimulates collagen production, reducing fine lines and wrinkles. It also brightens and plumps skin for a more pure and natural complexion. ANTI-AGING WRINKLE SERUM: The Best Vitamin C Serum restores and regenerates skin, attacks free-radicals, and repairs unsightly skin blemishes. Skin will appear luminous and radiant. It is an age spot lightening serum. BRIGHTENING SERUM: Mild and natural, this natural anti-aging skin care serum is fast absorbing, non-greasy & non-sticky. Our Vitamin C + Hyaluronic Acid+E+Amino Acid+Botanicals is gentle yet packs a powerful punch in the anti-aging fight. Only one dropper squeeze is enough. A little goes a long way! Vitamin C serum has become a big part of my skin care routine. It really makes your face feel tight and firm. Now I don't have any wrinkles yet. (In fact sometimes I still get mistaken for a high school kid. . . even though I'll be 29 in October). However, I'm hoping this will help slow down the appearance of wrinkles. I did a little bit of research on Vitamin C Serums and read that Vitamin C serums are great for your skin to help protect against sun exposure. It will help redness go away sooner. Example: I go running pretty much every morning and before I got smart and put on sunscreen . . . I would get a little red on my cheeks and nose. Since I read that Vitamin C serums help with sun exposure I applied it in the morning and at night and before I knew it the redness was gone! I have only been using this Vitamin C Serum for a few weeks and websites online claim it may take 6 months to see the full benefits. Vitamin C serums fight against wrinkles, age spots etc. 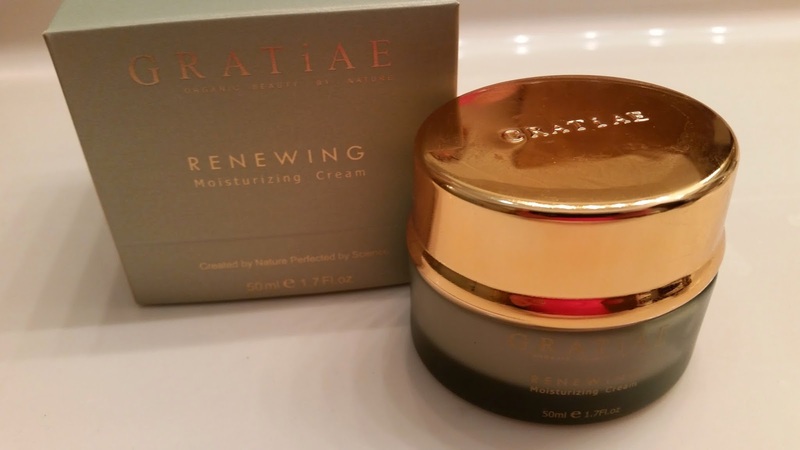 One word can describe this moisturizing cream: luxurious. 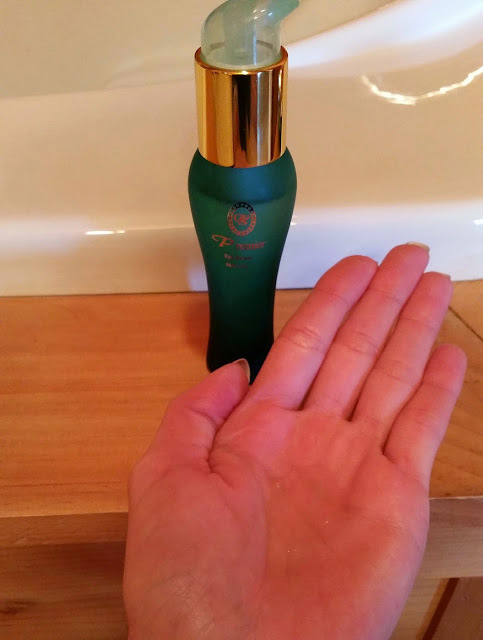 I have been using this fabulous moisturizing cream for a couple of weeks now in my morning makeup routine (and sometimes at night before bed). It feels absolutely amazing on your face and leaves you feeling moisturized. I will be hard pressed to go back to my O'lay morning cream after this treat! Even the packaging makes this product seem luxurious. The container is glass. GLASS! It comes with a little spoon to scoop out the perfect amount. Only a little bit is needed. It goes a long way. The only con I see in this product is the price of $129.99. However, you get what you pay for! 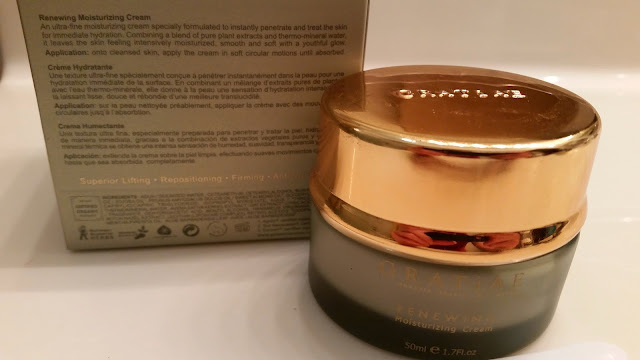 If you want luxury on your face, this cream is completely worth the price. I am addicted. (My husband might not be so happy). ORANGE You Glad It's ALMOST Friday?! 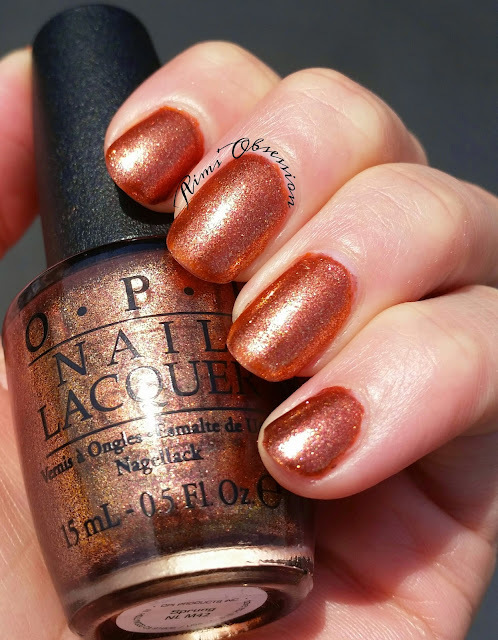 OPI Sprung is more of a copper color than orange (although I layered it over an orange base!) I used 2 coats of this shimmery polish over Julep Kaylen (from last week's post). I have read in other blog posts that if you don't layer Sprung over a base color then opacity will take about 3 coats of polish. Not bad! The formula was great, a hidden gem in my sea of polishes. 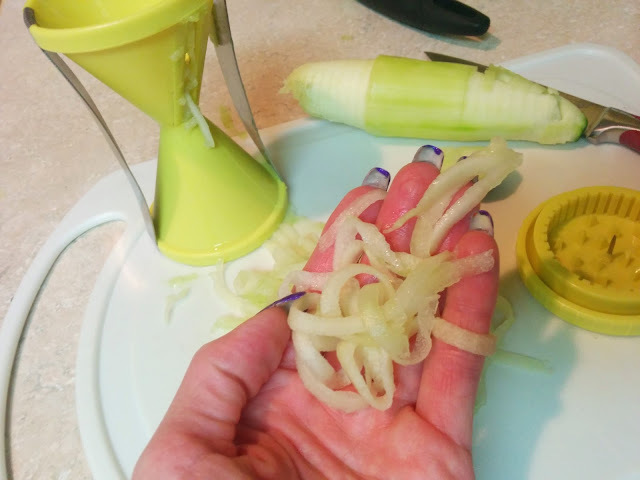 I received the Super Swizz Spiral Slicer for an honest review and was super excited to try it out! The Super Swizz Spiral Slicer is a stainless steel product equipped with special Japanese blades in two sizes. It comes with a safety guard to attach to the vegetables while slicing so you don't get your fingers close to the blades. 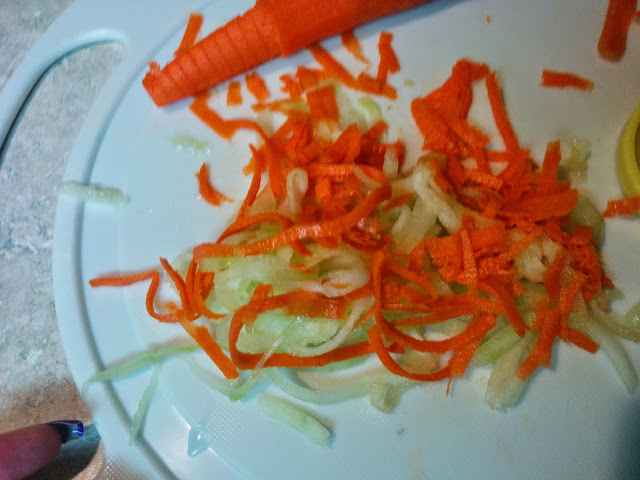 Slicing is super easy, fast and almost a bit fun! Salads won't ever be the same in this house! 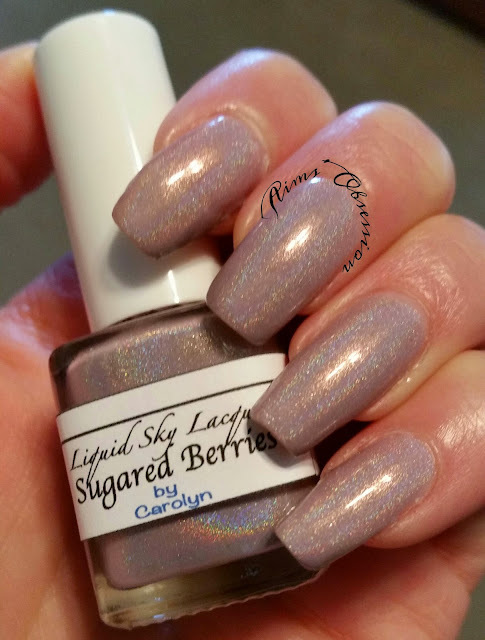 A little while ago I won a gift certificate for Liquid Sky Lacquer through a giveaway Carolyn was sponsoring. I was super excited because I had never tried Liquid Sky Lacquer before, but have heard amazing things. Carolyn contacted me and let me know to choose which colors I wanted and she would send them right away. I told her that I would love for her to send me some minis and only requested that one of them be a certain color and the rest she could pick which she would like to see on my blog. 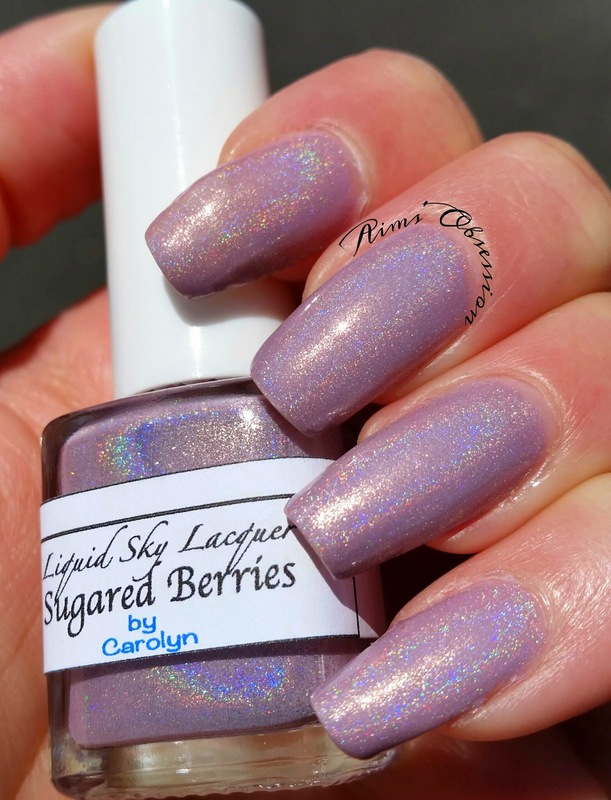 One of the colors she sent me was Sugared Berries! It is a 5-free polish, meaning it is free from: ormaldehyde, Formaldehyde Resin, Camphor, Toluene, and Dibutyl Phthalate (DBP). I was super impressed with the formula of Sugared Berries and can see what everyone is raving about all of the time on the different social medias! I only needed to use two coats of polish to achieve this look and it went on so smooth and flawlessly. (Smooth like butter!) I can see more Liquid Sky Lacquer in my future for sure! 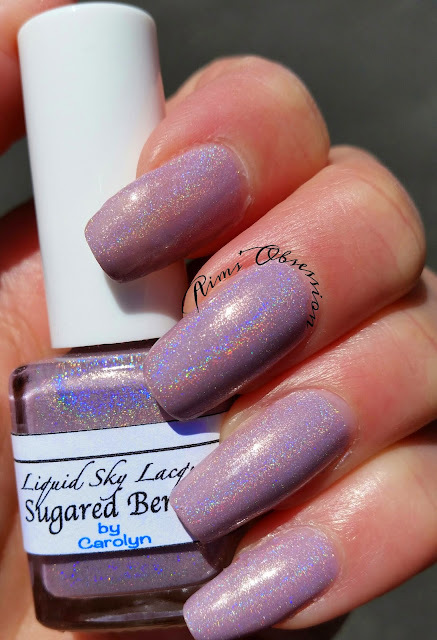 Sugared Berries is available for purchase on the Liquid Sky Lacquer bigcartel website for only $12 for a full size (15mL) bottle and $6.25 for a mini (7mL) bottle. 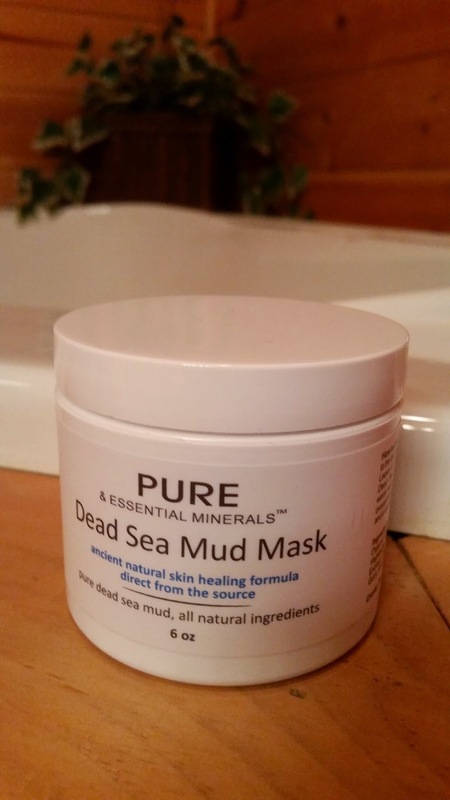 - Formulated with pure Dead Sea mud and natural moisturizers such as Olive Oil, Grape Seed Oil and Aloe Vera. 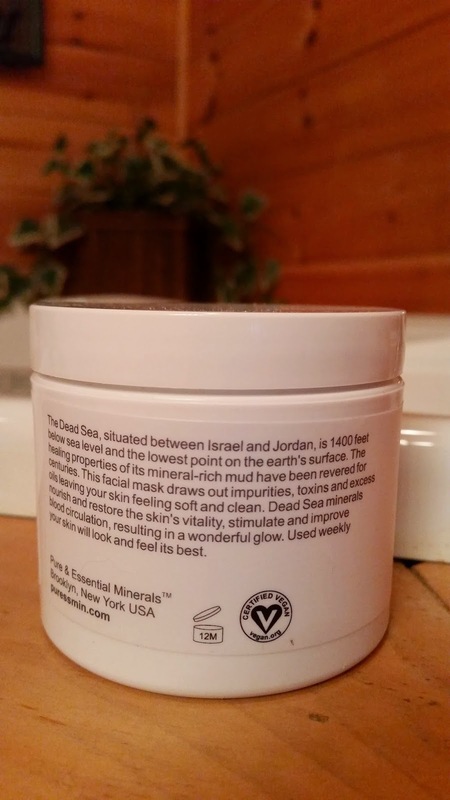 - Dead Sea Minerals present in the mud provide relief for a dry or irritated scalp and leave hair naturally moisturized, fuller and manageable. - Vitamin E strengthens the hair root and Chamomile leaves your hair soft and flexible. - Formula based on Dead Sea Mud brings relief from the symptoms of Seborrhea Dermatitis, Psoriasis and other scalp-related problems such as Dandruff. Directions: Apply to the Scalp and massage gently for 2-3 minutes. Rinse, apply shampoo again and leave for 5 minutes. Rinse thoroughly. Demineralised Water (Aqua) & Dead Sea Water, Sodium Laureth Sulfate, Cocamidopropyl Betaine, Cocamide Dea, Fragrance (Parfum), Glycol Stearate, Propylene Glycol & Chamomile (Anthemis Nobilis) Extract & Algae Extract & Papaya (Carica Papaya) Extract & Aloe Vera (Barbadensis) Gel, Sodium Chloride, Dead Sea Salt, Polyquaternium – 7, Wheat (Triticum Vulgare) Germ Oil, Grape (Vitis Vinifera) Seed Oil, Sweet Almond (Prunus Amygdalus Dulcis) Oil, Carrot (Daucus Carota) Seed Oil, Olive (Olea Europaea) Oil, Shea Butter (Butyrospermum Parkii), Panthenol (Pro Vitamin B5), Citric Acid, Tocopheryl Acetate (Vit E), Methylchloroisothiazolinone, Methylisothiazolinone. 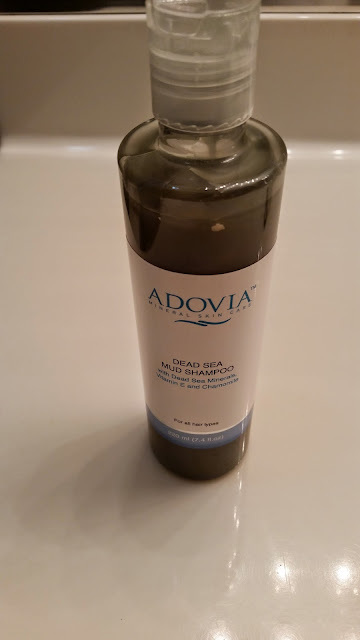 As you can see from the pictures, I have not been using the Adovia Mineral Mud Shampoo very long. I've used it probably a week tops. Mostly because when I first used it my hair felt so tangled in the shower. I hate feeling like I can't brush my fingers through my hair while I'm showering. Literally it felt like a "rat's nest" of tangles. I stopped using the shampoo for a couple of weeks but this past week I decided to give it a try again. I'm really glad I did. I must have had some other issue going on with my hair the first day I tried because this whole past week my hair has been fine. While I have not had any scalp related problems, my hair is very fine and thin. If I blow dry my hair straight it won't look very full. I found that my hair seemed like it had a lot more body to it after using this shampoo. I paired it up with a conditioner from the same company (review to come soon). Cons: The bottle is a little on the expensive side ranging from $23 on the CleopatrasChoice.com website and $27 on amazon. Will I buy this product in the future? - Due to price. . . probably not, I have use a different brand that I can get shampoo and conditioner 3 times the size for a little over the price of this shampoo. Hey ladies (and possibly gentlemen!!) Welcome back for another installment of "Orange You Glad It's Friday?" This is my second week in a row being on time with this post! Everyone say "HOORAY!!" :) I'm pretty proud of myself. A little for-warning before you read this post. I am going on vacation to North Georgia next week. This vacation will consist of mountain biking, hiking, etc. Therefore. . . I shortened my beautiful nails down to nubbins for safety reasons. I can only imagine the catastrophes that might happen to a long nails on the mountain bike or hiking path! Ok now on to what you came here for! I either purchased or got this bright orange polish off someone in a Facebook group brand new. 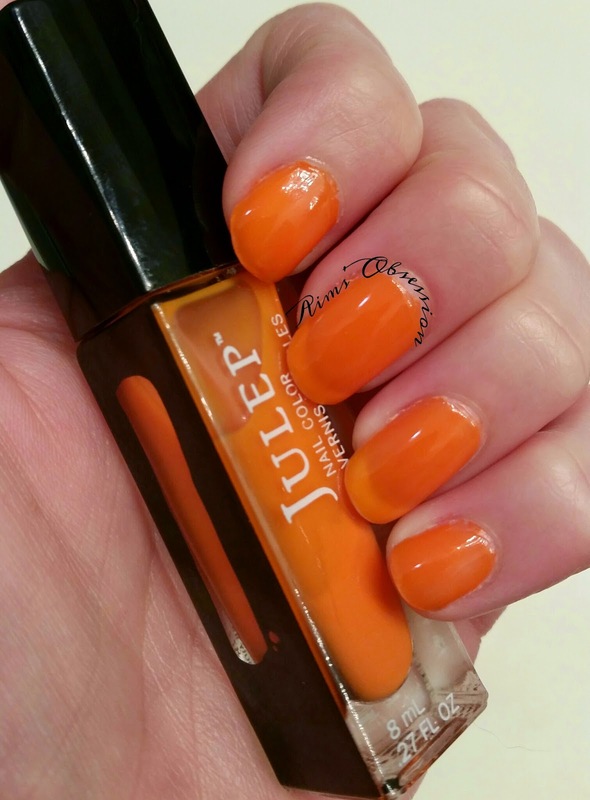 This is Julep- Kaylen. 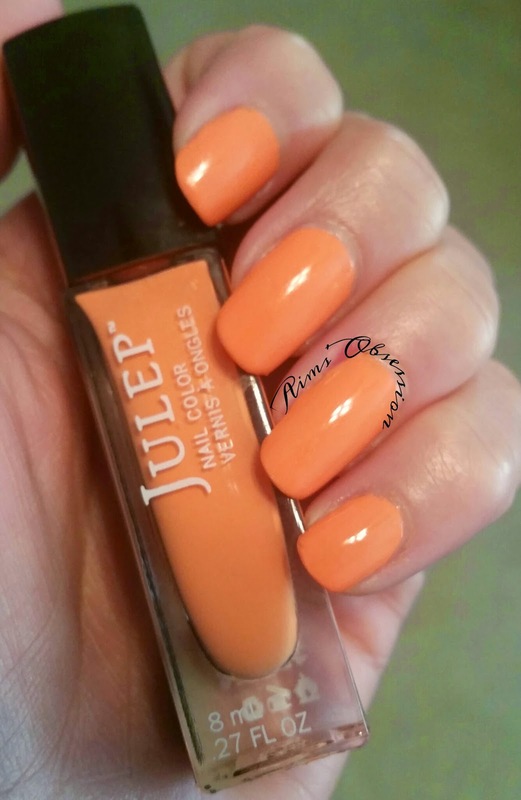 Kaylen is a bright orange creme polish. 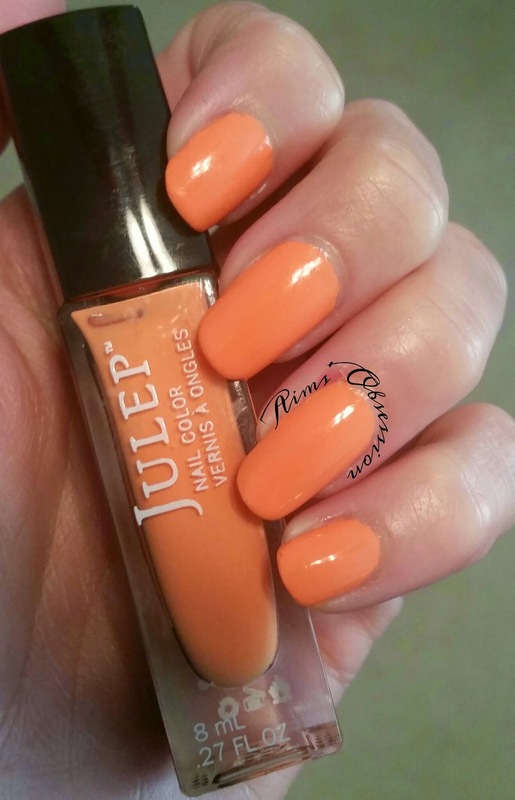 Unfortunately, when I looked on the Julep website, I did not see it available for purchase currently. So if you fall in love with this color you might have to check out polish trade groups on Facebook. While I do love the bright orange color of Kaylen, I am not in love with it's formula. I found the formula to be somewhat chunky in places. To avoid chunks I had to wipe the brush on the inside rim of the polish multiple times. Dry time was fairly nice though. I also only used 2 coats of polish for this look. It is not totally opaque. If you want total opacity you would probably need 1 or 2 more coats on top. I really like the look of just 2 though! 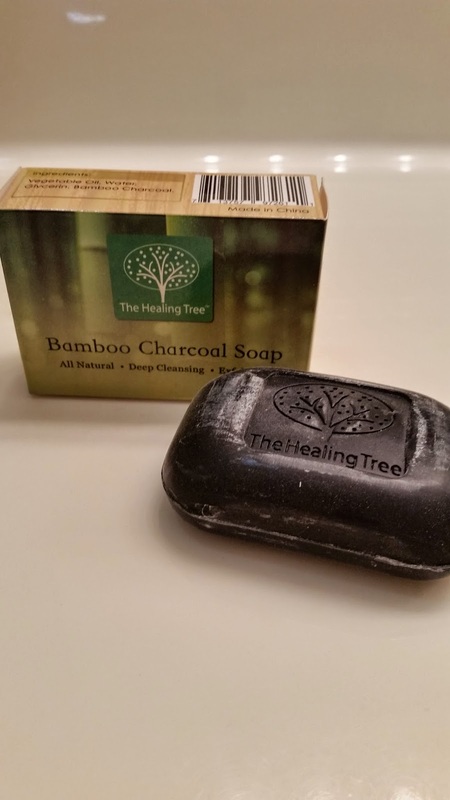 I received the Bamboo Charcoal Soap from The Healing Tree a couple of weeks ago and have been showering and testing it out ever since. The Healing Tree is a family owned business whose mission is to provide effective and affordable natural health products worldwide. - Let's your skin breathe. The ingredients of this soap are: Vegetable Oil, Water, Glycerin, and Bamboo Charcoal. One cool thing that I found fascinating about this soap was the charcoal coloring that the soap left while you lathered it on. (See above picture). It reminded me of those pictures you see of people lathering up in mud baths. I found it quite entertaining in the shower. The charcoal coloring washes right away, so no worries bout looking dirty. It also leaves your skin feeling super clean, since it seeps down into your pores and washes them out instead of just cleaning off surface dirt like many other soaps. Join The Healing Tree's Newsletter for Your Chance to Win FREE Monthly Products! Krys from Vapid Lacquer/Smelly Goods & Pretties has made another polish to add to her Good Causes... Good Things section of the shop. (This will be added on Saturday June 7). Half of the proceeds of this new polish will be going to Alex's Lemonade Stand. 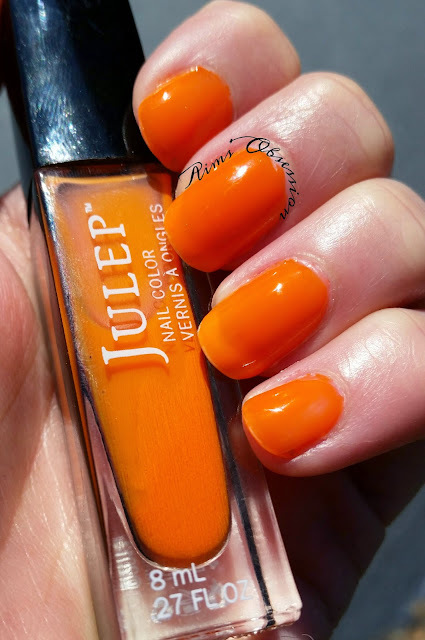 Krys sent me this polish for an honest review and to share with you! So excited! Read more about where donations from sales of this polish will be going here: Alex's Lemonade Stand Foundation. - Alex's Lemonade Stand Foundation is a foundation which raises money for the awareness of childhood cancer causes. Proceeds go to research into new treatments and cures. 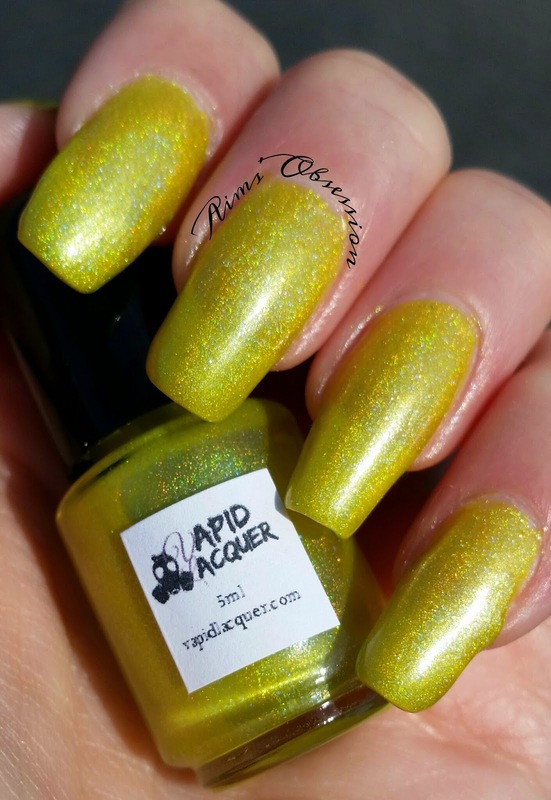 Krys picked the perfect date to release this gorgeous yellow polish because this weekend is National Lemonade Days. 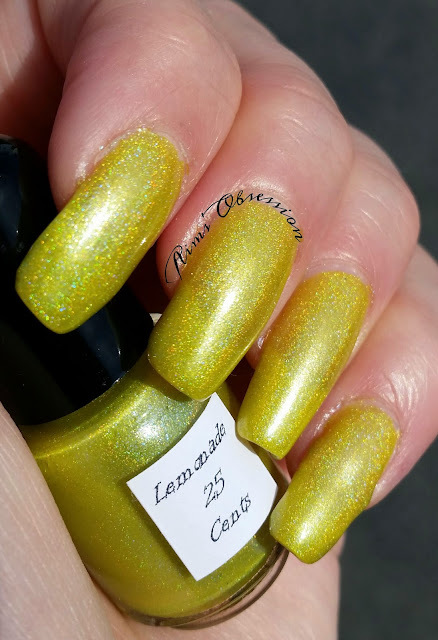 Lemonade 25 Cents is a gorgeous, bright and fun yellow jelly holographic polish that really pops in the sun! I am loving this color and formula. The polish went on smooth and dried pretty quickly (especially with my Vapid Lacquer Quick Dry Top Coat). 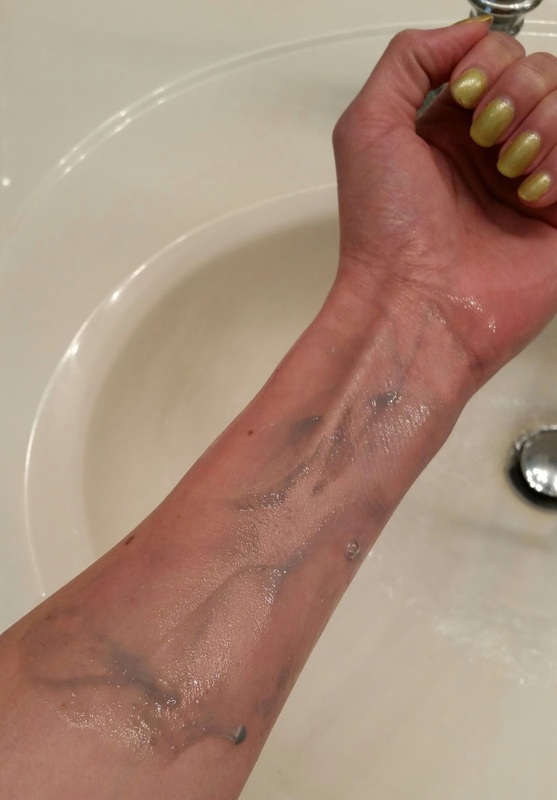 To achieve this look I only used 2 coats of polish. If you are noticing a trend with Vapid Lacquer. . . most of her polishes only need 2 coats. LOVE that! Also, I've been wearing "Lemonade 25 Cents" since Saturday with no signs of wear. I'm going to be sad to take this beauty off. 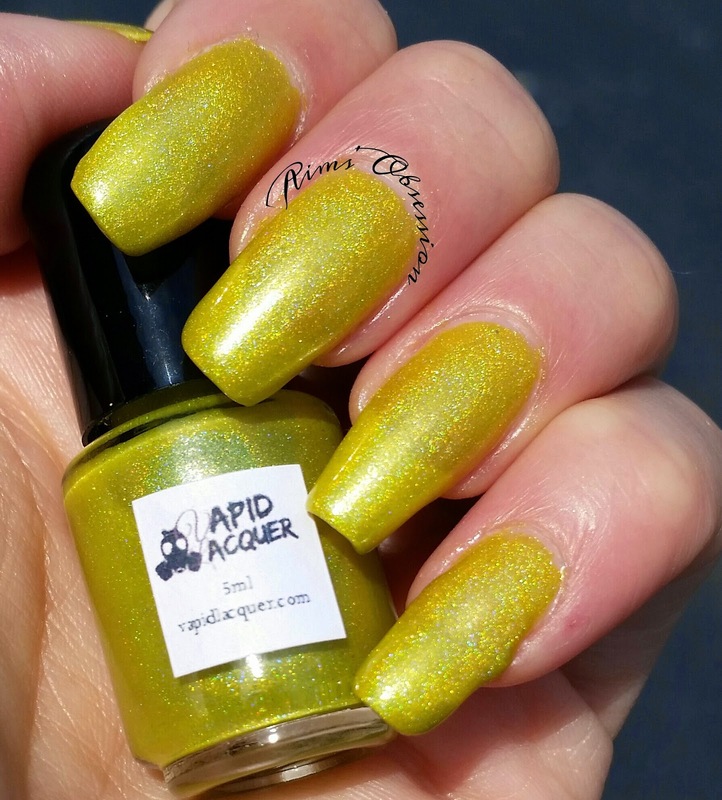 If you are in love with this polish as much as I am, be sure to check out the Vapid Lacquer website on Saturday! Remember, half of the proceeds from "Lemonade 25 Cents" will be going to an amazing cause! Beautiful polish. . . awesome cause. . . win/win situation don't you think?